"Sovdepia" was a pejorative term used by the Whites to designate areas of former Imperial RussIA controlled by SOViets of Workers' and Peasants' DEPuties. But it's quite a useful term since it is a bit more accurate than "areas controlled by the Bolsheviks" which overlooks that there were - for short periods - anti-White and pro-Soviet areas controlled by other factions, notably the Left SRs. 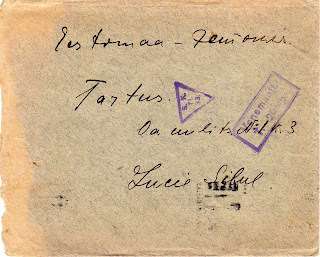 Anyway, Sovdepia was without postal connections to foreign countries from the beginning of 1919 until mid-1920. This is a really remarkable fact - very rarely in modern history has a country totally lost mail links to other countries. 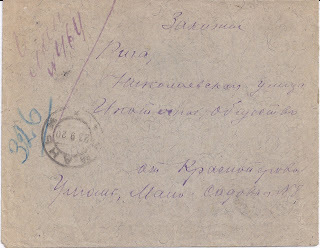 When mail services to abroad resumed in June 1920, then according to the Tariff of 7 June 1920 ordinary letters could be sent Free and Registered letters were charged at 10 roubles. 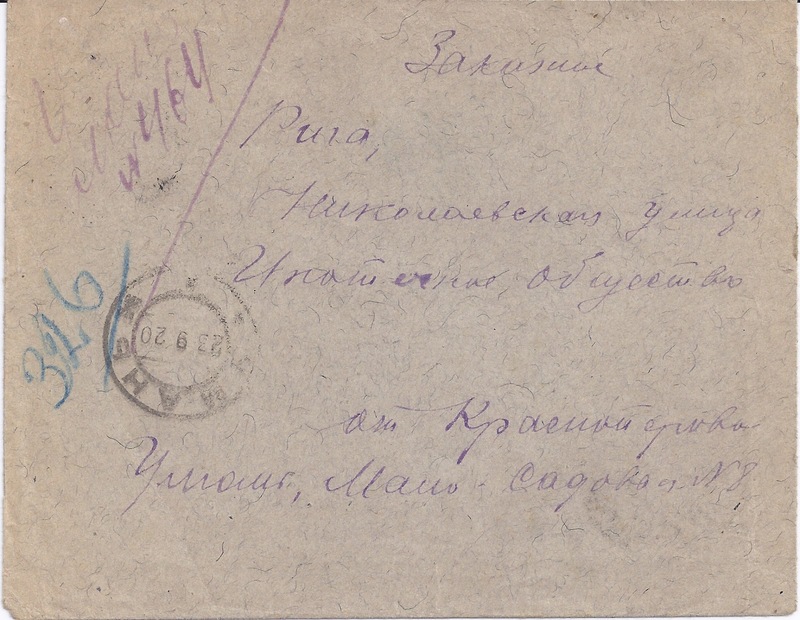 A new Tariff of 30 September 1920 abolished all the remaining Free post services, and set a charge of 5 roubles for Ordinary letters sent abroad and 10 roubles for Registered. 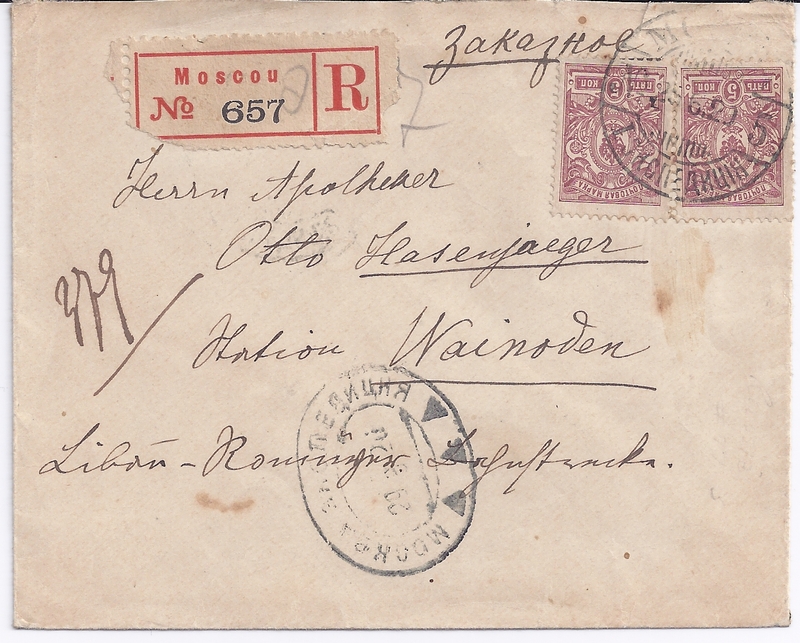 The final cover I illustrate shows that the 10 rouble Registered foreign Tariff was still in place in April 1921. For the Tariffs, I have used Alexander Epstein's work as published in the Journal of Classical Russian Philately, 2, 1998, page 29. Mail abroad in 1920 is very scarce - maybe one should say "Rare" - and the first half of 1921 is not much better! The trio above came from three different sources: the Robert Taylor collection (Moscow cover), a recent Christoph Gärtner Auction (Uman cover) and the John Whiteside collection (Pskov cover|). 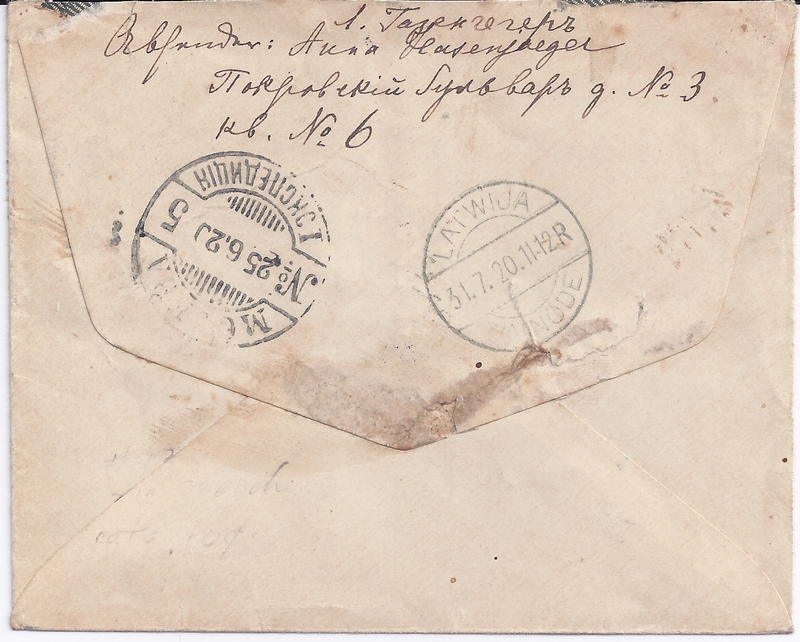 Added 3 July 2013: Vasilis Opsimos kindly sent me scans of this very interesting cover which started out from PODOLSK MOCK on 23 2 , arrived in Moscow 29 II 21 [machine cancel on reverse] but held there at least until 16 4 21 when a Moscow three triangle censor mark was applied. 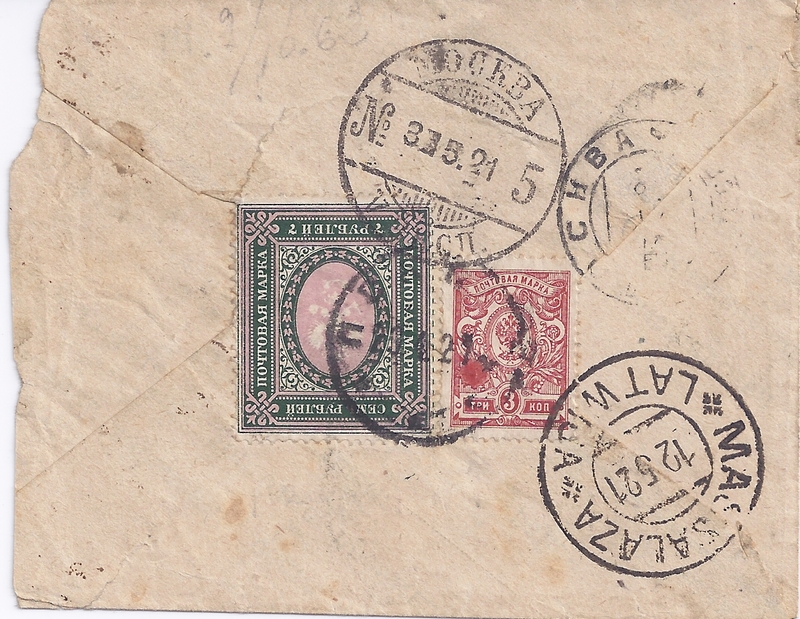 It was then sent to Riga, where as an unfranked item it attracted Postage Due [ Peemaksat] - Latvian Postage Due marks are quite common at this period. The really interesting thing about this cover, as Vasilis points out to me, is that it addressed to travel via the "Department of Diplomatic Couriers" in Moscow [ see third line of address beginning "Otdel ..."]. This may explain why it started out as a Free Frank item [ unless it was Paid in Cash and the fact noted on the missing back flap]. Perhaps it was delayed in Moscow because the "Department of Diplomatic Couriers" no longer functioned or would not handle this item. Who Knows? 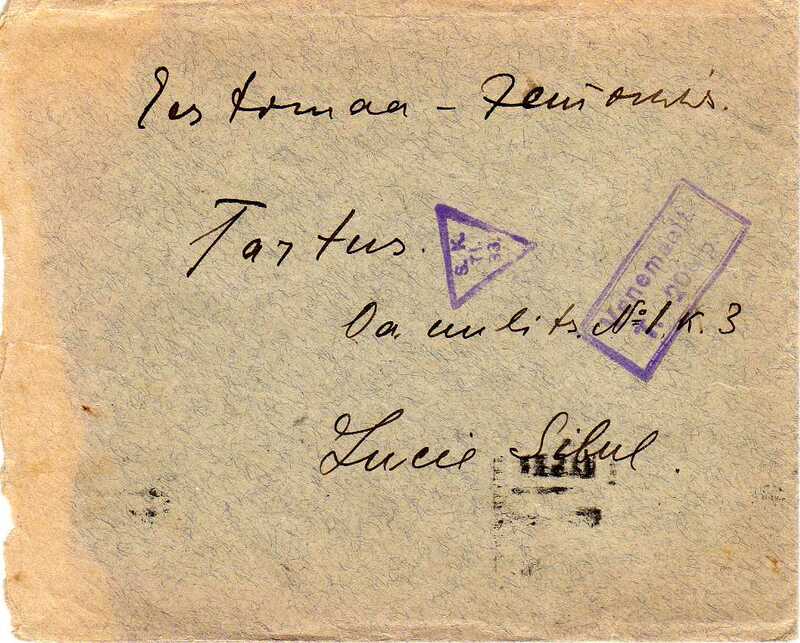 Added 14 July 2013: Alexander Epstein kindly sent me the scans below. 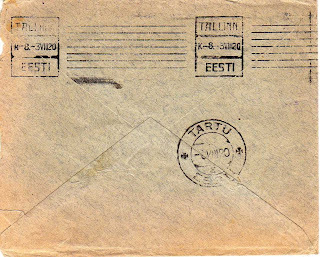 They show an unstamped letter addressed in both Estonian and Russian at the top and addressed to Tartu. 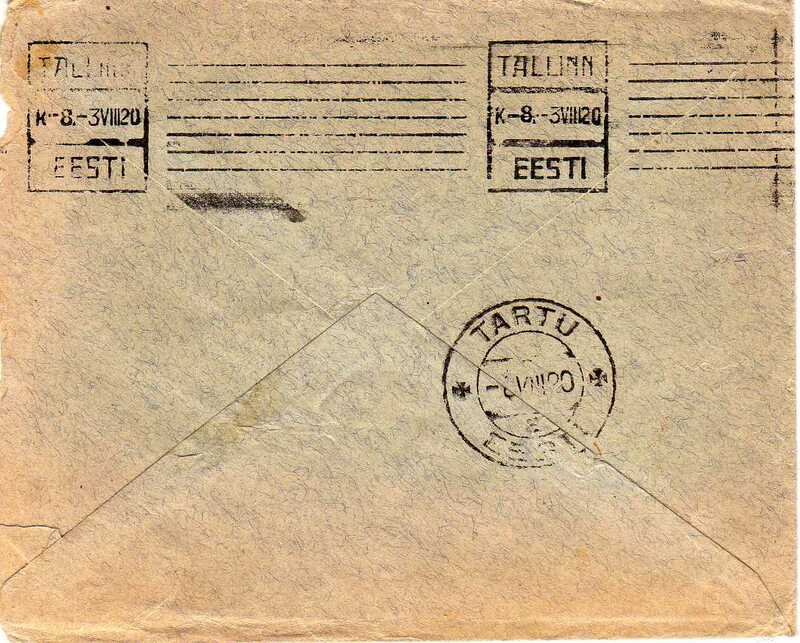 On the back is a Tallinn transit roller cancel 3 VIII 20 and a Tartu receiver. 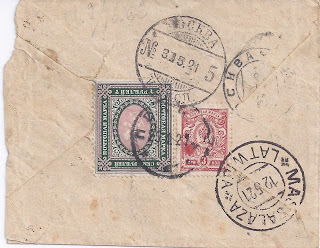 On the front is an Estonian censor triangle and a Postage Due cachet. 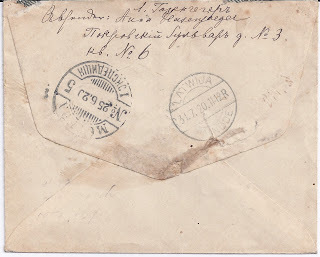 This cover is most probably from Russia, sent during the period when ordinary letters abroad were Free, but according to Epstein would have been sent with Russian diplomatic mail to Tallinn rather than through the Russian post office - there are no Russian markings at all. 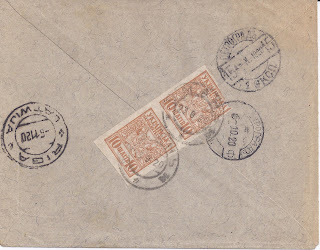 Epstein says that the Postage Due raised is the actual cost of an ordinary letter rather than twice the cost, as would be usual for Postage Due. 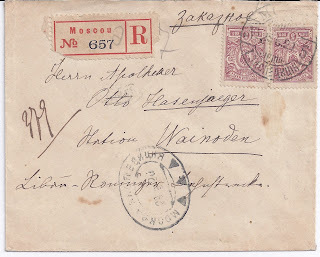 This suggests that the letter was put into the Estonian mail stream in Tallinn as part of an agreed procedure for handling Russian mail. Of course, this is a rare item.